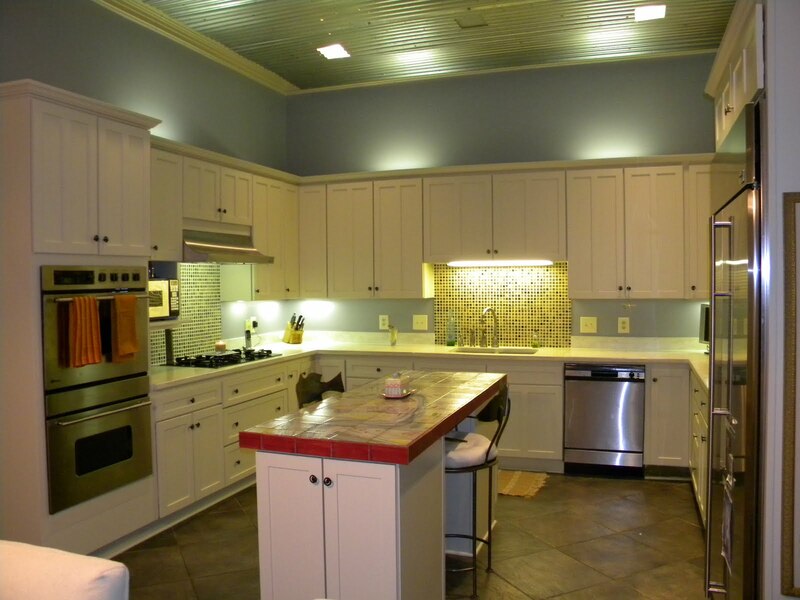 This client wanted to update her kitchen. She is preparing her house for sale and wanted a more neutral palate to better sell her home. My advice is to spend most of your budget on the kitchen and master suit when designing a home. You'll get a better return on your investment when your ready for resale. We pulled out the countertops and replaced them with poured concrete. Concrete can come in a variety of colors and we choose an off-white color. Her cabinets were originally painted in greens and reds and we choose a creamy off-white color to compliment the counter tops. This gives a clean, crisp look to the kitchen and also looked great with her slate floor. We choose slip covered chairs in the same color palette and I think the fabric soften the room. It's great to use a slip cover because you can always through it in the wash and it will always look and stay clean and fresh. The client choose the blue wall paint and it pairs nicely with the back splash. Instead of covering the entire back splash we only tiled over the sink and stove. This was a way to add a bit of flare to the room and was also cost effective. 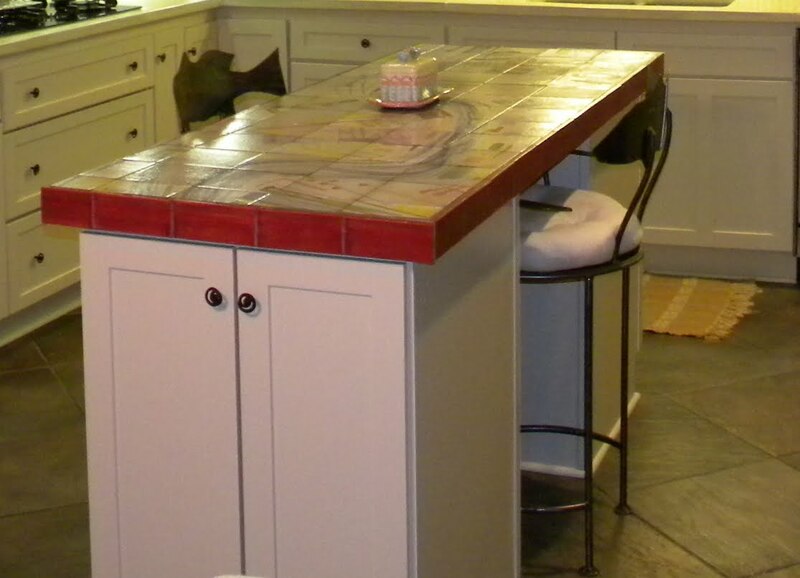 My client already had the hand painted tiles installed for the island top....they are just beautiful and show off her personality and add charm to the room. I always encourage my clients to leave little bits of their personality in each room. A collections of items that they love, a great piece of art ...anything that tells your guest a little bit about you. We also freshen her den furniture. My client is not afraid of color. She originally had a beautiful black Oushak rug with a busy pattern. I encouraged her to again go netural. A simple sisal rug will allow for the bold new orange fabric for the sofa and a fun green patten for the love seats. This room can handle that kind of color because her walls and floors provide a neutral base to play off of. That neutral base invites bold color in her fabric and art. Art In Bloom is a fundraiser for New Orleans Museum of Art and is one of my favorite events. The theme this year was "Green" and could be interpreted as eco-friendly or just plan green. There are local artists, designers, area schools and garden clubs that participate and showcase their creative spirit. My category was Tablescapes. I selected a natural fiber called jute (otherwise know as burlap) for my table skirt. It was tan in color and trimmed in a green pleat around the bottom. I wanted tailored look for such a casual fabric. I used my Mother's Lenox china, Gorham silver and Waterford crystal for the place setting. I shook up these traditional pieces with Annie Glass for the chargers, and and funky water glass with a green and gold design. I used sheet moss for the place mates, filled the berry bowls with beautiful mums, the tea cups with rye grass and the water glasses with bamboo sticks tied with raffia. Kim Weir, the floral designer at The Plant Gallery helped me design the centerpiece. I used my Mother's Soup Terrain for the centerpiece and I wanted the floral arrangement to translate to the Soup Terrain. I asked Kim to use Kail in the arrangement (Yes, Kail is a relative of the cabbage family)...I've had cabbage soup before, have you? HA! Kim suggested incorporating the roses to give the display an air of elegance and to balance out the earthiness of the Kail. The chairs and napkins came from Home & Garden. 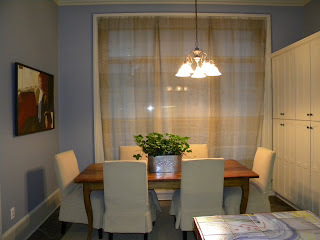 Notice the chairs are Aiden Grey and the back of the chair is covered in burlap; a great compliment to the table skirt. I love that store. They have everything from perfumed soap, bed linens to sofas and other fine furniture items. I always encourage my clients to start there when designing a room. It was wonderful evening! I hope to participate again next year! I was so delighted to be featured on the popular blog Willow Decor recently! Check it out!! Here is the link! 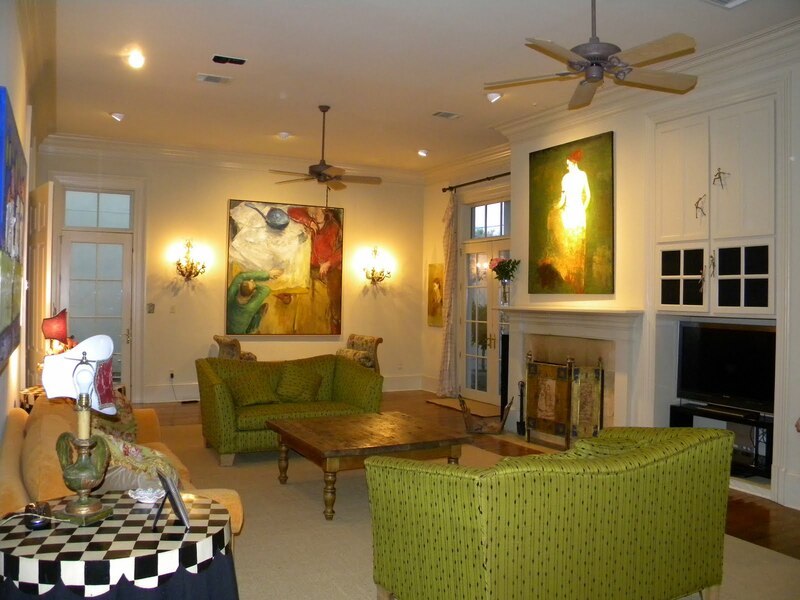 It is my passion to help people create beautiful spaces within their home. It does the heart good to walk into a room and feel calm, comfortable, elegant and ultimately happy. My client wanted to update her sitting room. She wanted to customize the room to a current but classic look that would never go out of style. 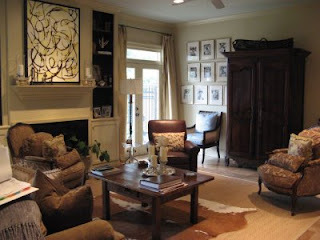 I envisioned a Gustavian influence for her space that would offer a sophisticated feel coupled with comfortable style. The one thing that can dramatically change the look of a room is the lighting. We changed her existing chandelier to one that was truly artistic by nature. Her previous chandelier was too dark in color and casted a heavy look to the space. This chandelier offers an open and airy look that instantly sets a formal and upscale tone to the room. I love it because the lines are flowing and it is painted with accents of gold and silver that will repeat throughout the room. It immediately introduces the room as elegant. The fireplace before had a pretty reproduction landscape hanging over it. The color of the room was a moss green and the dark color absorbed the natural light that comes in from the adjacent wall of windows (it was hard to capture a picture of that wall because there is so much natural light). I changed the color to a neutral pallet which opened the space nicely and made the room look much bigger. I wanted a contemporary piece of art over the fireplace that would be playful in spirit. The room was already designed to be upscale and formal but I also wanted the space to offer an Ora of fun and relaxation. This wonderful painting by Jonathan Shaw communicated the look of both formality and fun. Jonathan's painting is on a boxed cedar panel and the figure is made out of Phoenician plaster, metallic leafing and tinted waxes...very innovative! The gold and silver figure reflects the light nicely and is part of the gold and silver repeat accents in the room. I commissioned the art because my client's fireplace is long and "boxy" and most of the paintings we looked at did not balance the space according to scale. This painting, when it is hung, will be perfectly proportioned over the mantel. Here is a closer look at the original piece of art that was the inspiration for the commissioned piece. The back wall opposite the fireplace needed some style. I envision an antique reproduction mirror from Tara Shaw's new Maison furniture line... or a one of a kind hand painted trumeau from Julie Neill. Once I find the perfect piece that my client loves I will update my blog with the completed look! We replaced her dinning room chairs with chairs that are painted with the Gustavian patinas. The back wall now is dressed with two beautiful arm chairs that are covered in Belgian linen with a cut velvet applique. It is a traditional damask pattern with a current twist of Belgian linen introduced in the fabric. The carved detail in the arm chairs are "simply" beautiful. I love the cocktail table; the top is an aged mirror surface with metal legs and contemporary lines. Again, it repeats the silver and gold in the room and reflects all the great light pouring in from the windows. The crown on the table supports the playful and elegant air to the room. Here is an up close look at the crown...I love crowns! The side wall before had a closet door that was painted the same color as the trim and it interrupted the flow of the wall. Once the door was painted the same color as the wall it "disappeared." To save money and time in completing the project we choose a paint color that would cooperate with the current trim color. Now the eye is drawn to the fabulous furniture and not the closet door. My client loves the Aidan Gray lamp (she's not in love with the side table so you will have to check back once the room is finished to see what table she choose for the room). I think Aidan Gray has a classic style. The lamp is a quality piece that could be placed in any room. 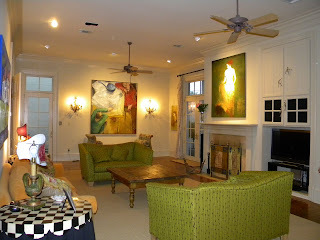 I strongly suggest my clients purchase pieces that can be moved from room to room or home to home. The sofa before worked well with the previous wall color but does not fit the style or tone of the room now. It's rounded arms and two large back cushions are comfortable and would be better suited for a more casual room. Her new sofa fits the style of the room perfectly because of the color and shape. It is tailored and complements the two arm chairs because of the painted carved wood and legs of the piece. I prefer a solid fabric on a sofa because it allows the flexibility to change the look and feel of the room by a simple switch of a pillow. You can have seasonal pillows, party pillows...the options are endless! I hope that my client has fun switching out pillows with accent colors and different textured fabrics. The bonus is that it looks like you have a new sofa every time you change a pillow. When I first begin a project with a client I like to understand how they wish to live in the space. This sitting room calls for one to relax and enjoy a good book, entertain guests before or after a dinner party or just "be" and stare at a beautiful painting. This room was dramatically changed by the paint color and investing in a few lifelong pieces. The room is not completely finished but its foundation is complete because of the anchor pieces; which are good art, lighting and quality furniture. The accessories are the fun part in finishing out any space. I encourage my clients to build a room over time to truly obtain an acquired look. More importantly, I encourage them not to be tempted to create a "manufactured" room that was displayed in a furniture store. Don't settle for buying in bulk just to get the job done. My client's money was wisely spent because she choose pieces that will last forever and be passed down from generation to generation. You can always freshen a piece of furniture with new fabric or pillows. I never advise buying a piece of furniture that will last for only so long; your investment should last forever. I look forward to posting the stunningly completed room! It will be well appointed with fabulous one of a kind accessories. Maybe a pair of garden urns to flank the fireplace or classic end tables or an antique bench parallel to the sofa. So many options...I can't wait to see the completion of this fantastic sitting room!